Nature does a lot to help our fruits and vegetables along, not least by providing a legion of beneficial insects to pollinate our crops and prey on pests. It's impossible to quantify just how valuable these creepy crawlies are in keeping things ticking over on the productive plot but suffice to say we're hugely indebted to them! It wasn't so long ago that the majority of gardening books recommended spraying a crop to within an inch of its life whenever the tiniest pest dared to rear its head. Thankfully these are more enlightened times and rather than wipe out both pest and predator gardeners are nowadays encouraged to strike a balance in the kitchen garden, nurturing the beneficial creatures so that they in turn take care of the undesirables. Making an insect hotel is a great way of achieving this. By breaking ground on your own bug des res you'll be setting yourself up for a significantly less troublesome growing season. An insect hotel offers free accommodation to its occupants. In return, when it's time to check out they'll be right on site to go about their pollination and pest predation – a beautifully symbiotic relationship. The good news is it costs nothing to make an insect hotel, just a little time and effort. Invertebrates aren't fussy as long as they have got somewhere to bed down and lay their eggs, so you can go as elaborate or simple as your tastes permit. While ready-made insect hotels are available to buy, it's great fun making your own bespoke hotel. Use salvaged or recycled materials to build the walls and roof of your hotel – old shelving planks, drinks bottles, pallets, pipes, you name it. The simplest structure is a wooden box open at one end and stuffed with the material that your insect will bed down in. Make sure your hotel is watertight so its residents don't get a drenching after every downpour. Tiles, offcuts of felt or corrugated roofing are some of the options for weatherproofing. You can make lots of small hotels or one major high-rise – the pictures here give a few ideas. Decorating the rooms of your insect hotel is the creative part. Think like a bug and pander to their every need! Different types of insect will prefer different room furnishings. If your hotel is big enough you can mix and match, using different materials within each layer or section. Try one or more of the following materials. Drilled wood: Solitary bees and wasps are attracted to holes drilled into wood as they offer the perfect place to lay their eggs in peace. Drill holes of different sizes, between 5mm (0.2in) and 10mm (0.4in) diameter so as to offer spaces for different species. Rotting logs: Perfect for wood-boring beetles whose larvae will feast on the decaying wood. Place at the base of your hotel so the logs stay nice and damp and mix with other decaying plant matter to attract centipedes (which devour slugs) and other woodland litter insects such as millipedes and woodlice (which will provide a welcome source of food for birds). This is also a great spot for garden spiders. Twigs, sticks and stems: Bundled together, sticks and twigs of different sizes offer welcome lodgings for ground beetles. These beetles chomp away at many of the pests that hinder our crops, including aphids and carrot root fly larvae. You'll also be offering a vacancy to ladybirds, which hoover up aphids and nuisance insects such as mites. Hoverflies will also be attracted to this type of material. Hoverflies are both pollinator and pest patroller – the larvae carry an insatiable appetite for aphids while the adults feed on nectar as they pollinate flowers. Bamboo canes: Hollow stems such as bamboo canes provide another hidey hole for solitary bees, who will lay their eggs then seal up the hole using mud or leaf litter. Straw, dried grass or rolled up cardboard: Just the material for a cosy lacewing hangout. While lacewings may be beautifully intricate to look at, they are truly the gardener's best friend, devouring aphids and other pests such as scale insects, many types of caterpillar and mites. Place your straw or cardboard inside an old open-ended plastic bottle to prevent it turning soggy. It's all very well building a handsomely equipped insect hotel but for it to become the destination of choice it has to be in prime position. Set your hotel up in a sheltered area of the garden or allotment away from the prevailing wind. Most insects prefer slightly damp conditions but solitary bees demand the sunniest aspect possible to help them get out and about on a cold day. Your hotel will become fully occupied quicker if it is located close to an existing insect hotspot: a hedge, bank of nectar-rich flowers or a pond, for example. Don't limit your insect-attracting ambitions to just one hotel. Remember that as well as helping the gardener out, insects support animals higher up the food chain, which will in turn go on to help us out. Log piles left in out-of-the-way corners, wildflowers sown around the perimeter of your productive plot, or a small pond are just a few of the other ways you can help. By doing so you'll be enriching the local ecosystem and ensuring your garden is as productive as it can be. "What a cool idea! Thanks"
"Insect hotels require minimal space and repay many times over with an on-site army of beneficial bugs!" 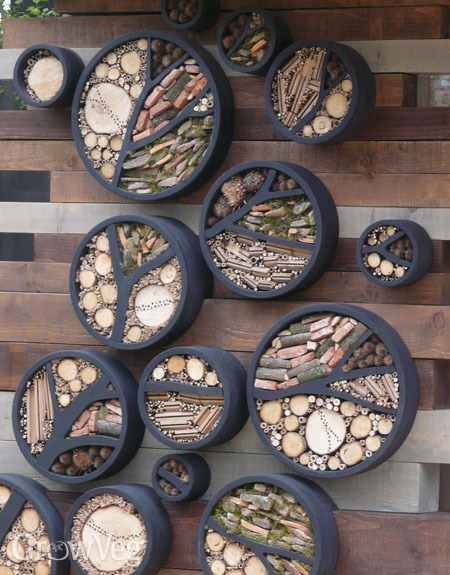 "Hi, I want to make this insect hotel but i don't know how to make the wood go in a circle without breaking? Csn you ppl lease explain how you did it?" "Hi Caroline. The insect hotels in the middle two pictures above use logs that have been drilled into to create hidey-holes for insects such as solitary bees. They also use bamboo canes cut in sections to fit and then stacked/pushed in together. The very top picture which uses the circular segments was a picture I took at a garden show - always lots of ideas at these sorts of events! Unfortunately I'm not sure how they did it in this case. But if you wanted circular segments like this you could try using wide-diameter pipes, tubs with the bottoms cut off, old drinks bottles etc. Good luck with your project - it will make such a difference to wildlife in your garden." "How far away from my house should I locate the hotel?" "Also, how far away from garden path should I locate my hotel?" "Hi Debbie. Insects aren't easily 'spooked' like birds, so the hotel can go as close to the house or a garden path as you like." "What are the black framed circles in the top picture made of?" "Hi Shelly. I'm not sure on this one - the picture was taken of a garden at a flower show. I would suggest they are made from wood. I would be inclined to use plastic pipes however, which would be long-lasting and keep the contents inside dry." "thank you very much this has helped me "
"We have small holes in the logs of our cabin and we see a lot of them with straw or dried grass sticking out of them - is this a infestation of a bug that is going to eat the wood of the logs or is this just a place to live for them?" "Hi Pam. It sounds like you may have solitary bees or a similar insect. However, I am not an expert in identification of insects, so it would be safer to ask an expert and to find out whether your wood needs treating - you don't want your cabin to come to any harm!" "Thanks for the great ideas! I featured them on ColorfulCanary! http://www.colorfulcanary.com/2016/02/hives-and-hotels-attract-more-bees-with.html"
"Hey! I was wondering whether the backside should look similar to the front (Meaning with all kinds of materials as homes for insects.) Or should it be closed with a wall, so the wind isn't such a problem?" "Hi NIna. It's generally best to have them closed off on one side to offer some shelter. Double-sided insect hotels can work, however, if the materials are deep enough so that they don't become soaked every time it rains." "Will an insect hotel attract and encourage population growth of undesirable insects - such as those that would feast on our plants?" "Gardening is very much about balance. Encouraging beneficial insects will help to stem the growth of pests. So while you may arguably attract a couple of undesirables, the vast majority will be beneficial, giving a net positive impact on your gardening." "Please advise the best time of year to put out a new bug hotel." "A new bug hotel can go out at any time of year. I guess you might argue that late summer is a good time, so that insects have somewhere to go and shelter for the coming winter. But really any time is a good time." "Hi. For the last couple of years Ive found that ladybirds use recesses inside my window frames to overwinter. I suspect this is because I dont start closing them until its starts getting cold. I sort of discovered this when the bathroom window was opened during the winter months to let steam out and I kept getting lots of ladybirds in the bathroom. I have bought some "insect houses" to help them out but Im unsure as to where to place them, do they go high up or low down, on fence or wall of house etc? Many thanks." "Hi Kathy. The exact same thing happened to me a few years ago! The best thing is to place ladybird houses in a sheltered, dry position - attached to a wall that is in a rain shadow would be ideal. It doesn't matter too much how high it is, so long as it's off the ground." "Hi there, I put up a bug hotel last year and it was used succesfully. It has been used again this year, but unfortunately I am about to move house. Can I take the bug hotel (complete with sleeping residents) with me to hatch out into their (my) new garden, or will it disturb them too much?" "Hi. Must admit, if it was me, Id leave well alone and leave what youve accomplished behind knowing its serving its purpose and do it all over again at your new house hoping for same results. The bugs will be the biggest winners then and you'll know youve helped them at two locations. :-)"
"That sounds great but I am concerned that the new people might not want it and could destroy it anyway (I rent so I don't know who is moving in)... It was only a small, shop-bought one so moving it would be very easy. I have plenty of time to move house so I could take it over very carefully...with that info, would you still leave it behind?" "Yeah, I know what you mean. People are unpredictable but who knows, you could maybe even be educating future tenants. You could take it with you and know its safe and sound or leave it and hope for the best. If you do move about and did put something cheap and cheerful up at every home you occupy just think of the nice nature footprint youd be leaving behind for the bugs each time you move. Im not judge and jury and Im sure whatever you decide to do will be for the right reasons. Good luck either way. :-)"
"Ok, thanks! It is a difficult one. I suppose I really just wanted to know if moving it would harm the pupae inside but as you say, it might nudge the new tenants in the right direction if I leave it for them. Thanks for your advice and I will keep you posted! :)"
"What a great article! I work for a nonprofit that does nature-based education at schools. We are battling with one school district about putting these up. They just can't understand that these are not like bee hives and are for beneficial insects. Any suggestions you might have would be greatly appreciated. I am going to forward this article to one of the principals. Thanks so much!" "Wow Patti - that's hard if they can't appreciate the distinct difference between bee hives and insect hotels. I guess you could emphasise the education nature of these insect hotels - the fact they are encourage biodiversity and how they will feed off other insects and equally provide food for creatures further up the foodchain - a great practical biology lesson! There's also wider lessons about out impact on the environment and how, in even a small way, everyone can make a small difference. Do emphasise the fact these are benign and will really tap into a child's curiosity about the natural world - which is innate in every little person. Irrespective of political stance, if our children are to be better custodians on the planet than we have been, then little things such as this are so important to help them begin to understand the wonder and diversity of life. 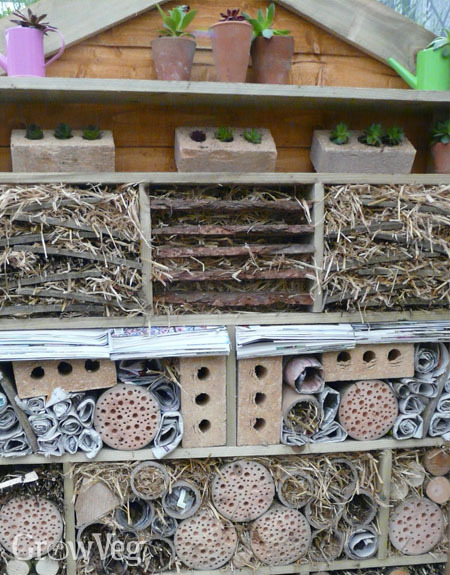 Insect hotels in schools are pretty standard here in the UK (and probably a lot of Europe). It would be great to see them in every school in every country! Good luck with it Patti. Please report back and let us know how you get on." "Just wondering how high up from the ground would get the best results." "They can sit on the ground, without a problem. This may possibly attract ground-dwelling beetles. Or they can go higher up for insects that fly in - lacewings, ladybirds/bugs, solitary bees etc. So it really doesn't matter. I guess try to keep it protected from wind if possible - that's more important than height." "I'm going to put a bug hotel up"
"Should the tubes be cleaned out every winter? I have read somewhere that they should, otherwise infection sets in and the hotel becomes unatrractive to bugs after one season. Unfortunately the bug hotels you buy at a Garden Centre all have fixed backs and cannoy be cleaned. What would you advise?" "MY comment sems to have been deleted and I can't distinguish between capitals and lower case letters in the Security Code." "Hi Debbie. Your comment came through okay. In answer to your question, there shouldn't be any need to clean out the insect hotel once it's made - just leave it to nature. " "This is helpful info. I recently put out a bug hotel, but it is right in the middle of our windy season in the Spring. Since have checked it, I still have full vacancy, but this may be due to the wind and rain. So I will find another location for it and see if that helps." "I loved this site. It is inspiring. Just one point - what are the depths and diameter of the drill holes. I suppose bigger bugs need bigger holes, so I assume a variety of sizes would be best." "Hi Helen. You're right - a variety of holes works best - any thing from a tenth of a inch (2mm) up to half an inch (12mm) is ideal. Drill them as deep as you can, so the holes are better shielded from the wind and rain." "I have no garden, but I do have a 20m2 sedum roof on the 4th floor that is attracting an astonishing number of bumblebees and a number of other pollinating insects that are too small for me to identify. The sedum should flower all summer long and there are lots of trees, parks and gardens in the area. I wondering if it is worthwhile placing such a hotel on the 4th floor (facing east and protected from the prevailing wind)? " "Absolutely. Many bugs will fly in, so the fact you're on the 4th floor shouldn't matter so much. The sedum roof sounds incredible - what a fantastic asset to have." "Hi Ben In the process of constructing a bug hotel. I was told to position the "bug hotel" in a north / north east location, is this correct. also any advantage to paint the bug hotel in a particular colour to attract the bugs. Thanks Colleen"
"Hi Colleen. It kind of depends on your climate, if it's very hot where you are then I'd be inclined to position it in a cooler, shadier location. But a sun-facing location is great if you're trying to attract insects such as solitary bees. A north/north-east location - assuming you're in Australia/NZ - would be perfect to help the hotel warm up first thing in the morning and throughout the day. With regards painting the bug hotel, it's really up to you. I'd be inclined not to paint it, or at least just the outside of the house, to keep it as natural as possible inside. I know lots of creatures are attracted to bright colours like yellow. But I don't imagine it would make a big difference to be honest." "Thanks for all this great info! I just recently bought a bug hotel and have just a small yard with limited locations to hang it. I am a devoted bird feeder so there are lots of birds in and out of my yard. Will they bother the bug hotel? I'm inclined to hang it beside a big tree where many of the birds roost. Or near the bird feeders as I have flowers there. Help!" "Hi Carolyn. There is every chance that insect-eating birds may eat one or two of the bugs from or around your hotel. But this is all part of a healthy garden ecosystem after all, so I wouldn't let this influence where you locate your bug hotel. Placing it in or near a big tree sounds like a perfectly good place to locate it - so do go with that. You could also locate it near any flowers for pollination. But either way I wouldn't worry too much - insects will travel and any new bug hotel to your garden will have a positive effect. Why not add a couple?!" "My bug hotel has had the ends of the holes filled in by some sort of insect - ? possibly a bee. Do I replace these canes? They have been like this for over a year." "Hi Jenny. Keep them where they are as they may still be housing an insect of some sort - very likely to be a bee. If you dispose of the canes you could be throwing away the bee with it!" "I’ve just learned about bug hotels and would like to build one this year. My question is, I live in an area that has very cold winters (-25F). Should I move the bug hotel into a uninsulated shed or cold garage for the winter for protection? Thanks!" "Just locate your bug hotel somewhere relatively sheltered in the garden. You are offering a refuge for native bugs, so the cold won't be a problem." "I have bought two insect hotels to hang on my shed at the bottom of my garden. I am looking forward to the end of autumn to see that i have some tenants move in.A"
"Hi Thomas. I hope you get some new tenants soon. Keep the rent cheap and I'm sure they'll move in!" "I am very pleased to let you know that i now have three new tenants. Rent free of course." " That is brilliant news, many congratulations! I hope the new tenants are finding the accommodation to their liking!" "My Garden Club is considering holding a workshop on creating insect hotels. When is the optimal time to have them ready for outside placement?" "Any time of year is good, though late summer to autumn/fall is a great time as some bugs will be looking for somewhere to overwinter." "Fantastic to be able to read answered questions, thank you. We are planning to give a ladybird hotel to my son's nursery as a leaving gift, and we would like to paint it in bright colours - would this frighten or discourage insects?" "Hi Lisa. No, I don't think it would scare them off. From past experience ladybirds are pretty gung-ho when it comes to finding somewhere to overwinter. I think your gift idea is fantastic - it will help enthuse the young ones about nature, which is so important." "I have just put up a bee hotel...the first occupant is a black house spider. An intelligent one as I presume he's going to be picking off the insects that venture in! What's best to do?" "That is a clever spider! I'd leave everything how it is. You're providing extra homes for wildlife, which is great. It's up to them how to divvy out the new accommodation!" "I have a shop bought bug hotel and by the end of last year all the tubes were sealed. It is occupied by bees only they are small with a reddish tail. Its location is on a flat garage wall and faces south east. I`m having a problem, as the weather heats up there is much activity and my path to my rear door passes beneath, although i have not been stung I would like to move this to a more secluded area. What time of day or night would you attempt to do this? It involves removing the screw securing it to the wall and carrying it to it new location. the wall is prepared to receive it. " "Related to Thomas' question - I've put up a small insect hotel but naively done so on a fence that is shaded at the start of the day. I want to move it onto a fence that gets direct sunlight first thing to help the bees warm up in the morning, but I'm worried that moving the hotel now might distress them or make them abandon it. What's better for the bees? Leaving them undisturbed with shaded mornings, or disturbing them for sunny mornings?" "Hi Thomas and Michael. It might be tricky to move the insect hotels now, while the bees are active. You risk disturbing them and potentially getting stung! It would be far better to wait until the winter when things are quieter and you can simply move them with no fuss. I'd also be concerned that bee houses moved now might cause some of the occupants - who might be out foraging - to become lost and unsure of where they home has moved to! It's unlikely you will be stung if you just leave them alone, so I wouldn't move them for that reason. Michael - I'd leave the bees undisturbed with shaded mornings, then perhaps look to move them over winter to a place that gets sun in the mornings too. But leave them alone for now if you can. "